Wisconsin’s emissaries of death, Jungle Rot, have unleashed their new video for the new single “Worse Case Scenario” from their critically acclaimed album, “What Horrors Await”. The video was directed by Jason Meudt and Emmet Austin of www.Vision4Films.com. The video features crushing old school death metal, leaving nothing but a blood-soaked battlefield in its wake; if you’re a fan of metal, you’ll dig this video! 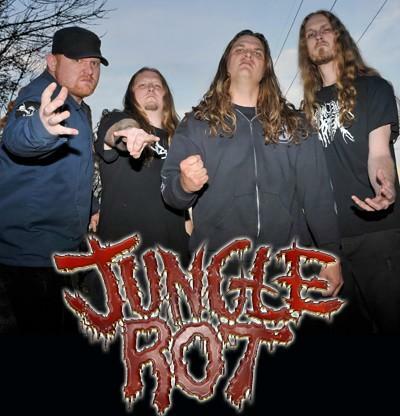 Jungle Rot will be heading back out on the road this Summer! Be sure to keep an eye out for upcoming tour announcements. The CD was recorded at Studio One in Racine, Wisconsin with longtime engineer Chris Djuricic. Artwork for the release was handled by Gyula Havancsák (DESTRUCTION, ANNIHILATOR, GRAVE DIGGER).